Japanese electronics company 'CASIO' has launched world's first Goods and Services Tax (GST) calculator in India for simplifying the GST calculations for tax payers. The company has two variants of GST calculators MJ-120GST and MJ-12GST in the Indian market. These new GST calculators will provide solutions for GST based invoicing. These GST calculators feature built-in GST tabs for all five slabs- 0%, 5%, 12%, 18% and 28%. It includes separate buttons for GST slabs to reduce time required for processing invoice. The tax slab buttons on these calculators include GST+0, GST+1, GST+2, GST+3, GST +4 and are changeable as per industry standards. These five buttons can store Gross value (net value+ Tax), net value and tax paid under GST slabs. These GST calculators also feature tax-mode application that will help taxpayers and traders to calculate base value of products by deducting tax from MRP. MJ-120GST calculator comes with GST+/tax- key that can calculate values in multiple formats i.e. gross value from base value in GST+ mode and base value from gross value in Tax - mode. GST GT key in the calculator can further determine the gross value of GST based calculation. Q. 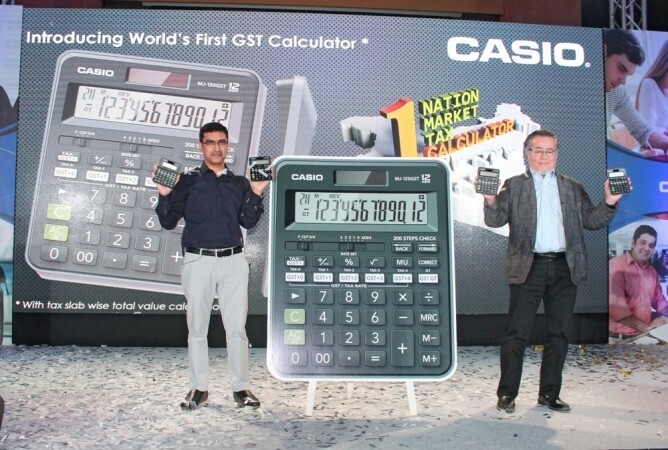 Which Japanese electronics company has launched world's first Goods and Services Tax (GST) calculator in India for simplifying the GST calculations for tax payers?